DCI World Championship Semifinals Lucas Oil Stadium, Indianapolis, IN Friday, Aug. 9, 2013 Scores from World Championship Prelims the previous night determined Semifinals performance order. A coin flip determined the order of the Cavaliers and Madison Scouts, after the two tied during Prelims. 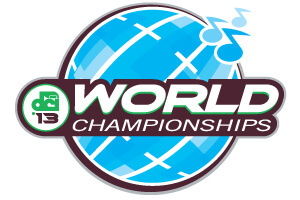 1:50 PM - Welcome and Anthems 2:00 PM – Music City 2:17 PM – Spartans 2:34 PM – Genesis 2:51 PM – Jersey Surf 3:08 PM – The Acaemy 3:25 PM – Blue Devils B 3:42 PM – Vanguard Cadets 3:59 PM – Oregon Crusaders 4:16 PM - Intermission (23 Min.) 4:39 PM – Mandarins 4:56 PM – Colts 5:13 PM – Pacific Crest 5:30 PM – Troopers 5:47 PM – Crossmen 6:04 PM – Blue Stars 6:21 PM – Spirit of Atlanta 6:38 PM – Boston Crusaders 6:55 PM – Blue Knights 7:12 PM - Intermission (40 Min.) 7:52 PM – The Cavaliers 8:09 PM – Madison Scouts 8:26 PM – Phantom Regiment 8:43 PM – Bluecoats 9:00 PM – Santa Clara Vanguard 9:17 PM – The Cadets 9:34 PM – Carolina Crown 9:51 PM – Blue Devils Scholarships Presentation Bonfiglio Chairman's Award DCI Hall of Fame Recognition Volunteers of the Year Recognition Age-Out Ceremony Last scores announced Eastern time zone. Times approximate and subject to change.